If you want to get ahead in FIFA 19 Ultimate Team, you're gonna need a lot of FIFA Coins. A great way to manage your squad and the FIFA Coins that you're bringing in is to make use of the FIFA 19 Web App. It allows you to swap out your squad, complete SBCs and more, and can be a great way to get a little more out of the game while you're away from your console. In this FUT 19 Web App Guide, we'll list everything you can do with the FIFA 19 Web App and Mobile Companion App. We'll take a look at how you can use it to make FIFA Coins, and also at the FIFA Web App Objectives that are on offer for those who download the app. For more on FIFA 19, be sure to head over to our FIFA 19 Guides Hub. It’s got links to a ton of useful info on FIFA 19, FUT 19, and FIFA 19: The Journey. The FIFA 19 Web App is a great way to manage your FIFA Ultimate Team Squad while away from the main game. Loads of FIFA players do just that, though keep in mind that not all features are available. We’ll detail what you can do with the FUT Web App, below. You can use the FUT 19 Web App to access and manage certain aspect of the game while away from your console. You can't access everything in the game, so don't expect to be able to play games or go too deep. There are some really useful things you can do with the FIFA 19 Web App however, and using it correctly can really raise your game to the next level. Squad Building Challenges - probably the most useful feature of the FIFA 19 Web App and Companion App is that you can manage FUT Squad Building Challenges. It’s a lot easier to move cards around in the Web App, and is a great way to make some FIFA Coins when you’re waiting for the bus. Objectives - the FIFA 19 Web App has its own set of objectives. More on that below. Share Your Squad - Unique URLs let you share your squad with anyone online. Manage Squad - You can manage your squad using the FIFA 19 Web App. Check Chemistry, build new squads and more. 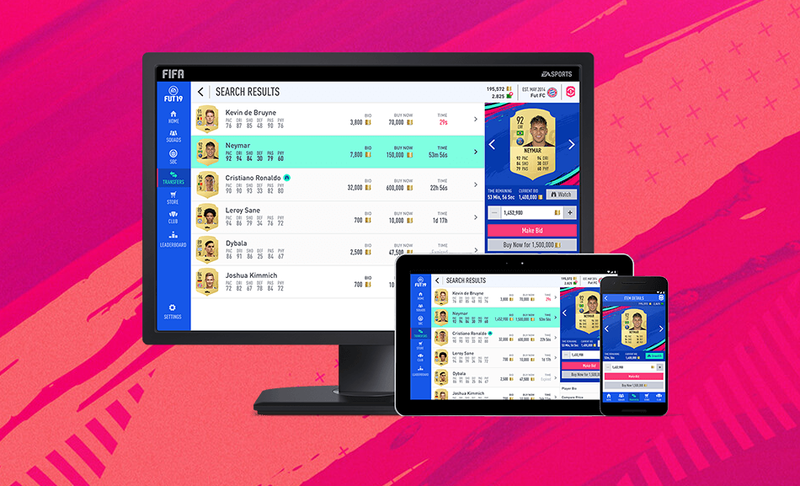 Transfer Market - Another extremely useful feature is being able to monitor and use the transfer market in th FIFA 19 Web App and Mobile App. You can buy and sell players, or just check-in to see what’s worth investing in. Buy and Open Packs - You can head to the store in the FIFA 19 Web App and purchase player packs. A great way to make some extra FIFA Coins is to take on the FIFA 19 Web App objectives. There are two types of challenges for you to take on: Weekly Challenges and Daily Challenges. You’ll want to consider tackling them, as they are separate from console objectives. PC and console objectives can be checked via the app as well. To make use of the FIFA 19 Web App, head over to the site and sign in using your EA log-in. Alternatively, you can go to the App Store or Google Play Store to download the Mobile Companion App for your phone.